Will American Exceptionalism Be Destroyed by the Entitlement Society? I wrote a celebratory post last November about the dramatic difference between Americans and Europeans. There truly is American exceptionalism in that Europeans are much more likely to think it is government’s responsibility to provide the basics of life. Another poll in 2010 showed Americans, by a 20-percentage point margin, want smaller government and lower taxes. A 2011 poll revealed negative views, by an almost 2-1 margin, of the federal government. And it’s not scientific, or even a poll, but I also enjoyed this Mark Steyn column describing how Americans were the only people in the world to protest for less government when the financial crisis hit. Perhaps most impressive is this data from late last year showing that Americans overwhelmingly view big government as the greatest threat to the nation’s future. But self reliance and individualism are not necessarily a permanent part of American DNA, and some left wingers openly argue that they want to create an entitlement mindset. Based on what’s already happened, Nicholas Eberstadt of the American Enterprise Institute is worried that the narcotic of dependency may be diluting American exceptionalism. Here are some key passages from Eberstadt’s column, beginning with a look at what makes America special. From the founding of our nation until quite recently, the U.S. and its citizens were regarded, at home and abroad, as exceptional in a number of deep and important respects. One of these was their fierce and principled independence, which informed not only the design of the political experiment that is the U.S. Constitution but also their approach to everyday affairs. The proud self-reliance that struck Alexis de Tocqueville in his visit to the U.S. in the early 1830s extended to personal finances. The American “individualism” about which he wrote did not exclude social cooperation—the young nation was a hotbed of civic associations and voluntary organizations. But in an environment bursting with opportunity, American men and women viewed themselves as accountable for their own situation through their own achievements—a novel outlook at that time, markedly different from the prevailing attitudes of the Old World (or at least the Continent). The corollaries of this American ethos were, on the one hand, an affinity for personal enterprise and industry and, on the other, a horror of dependency and contempt for anything that smacked of a mendicant mentality. Although many Americans in earlier times were poor, even people in fairly desperate circumstances were known to refuse help or handouts as an affront to their dignity and independence. People who subsisted on public resources were known as “paupers,” and provision for them was a local undertaking. Neither beneficiaries nor recipients held the condition of pauperism in high regard. The U.S. is now on the verge of a symbolic threshold: the point at which more than half of all American households receive and accept transfer benefits from the government. From cradle to grave, a treasure chest of government-supplied benefits is there for the taking for every American citizen—and exercising one’s legal rights to these many blandishments is now part of the American way of life. …Citizens have become ever more broad-minded about the propriety of tapping new sources of finance for supporting their appetite for more entitlements. The taker mentality has thus ineluctably gravitated toward taking from a pool of citizens who can offer no resistance to such schemes: the unborn descendants of today’s entitlement-seeking population. …The U.S. is a very wealthy society. If it so chooses, it has vast resources to squander. And internationally, the dollar is still the world’s reserve currency; there remains great scope for financial abuse of that privilege. Such devices might well postpone the day of fiscal judgment: not so the day of reckoning for American character, which may be sacrificed long before the credibility of the U.S. economy. Some would argue that it is an asset already wasting away before our very eyes. If you think Eberstadt is being needlessly pessimistic, you may change your mind if you read this and this. 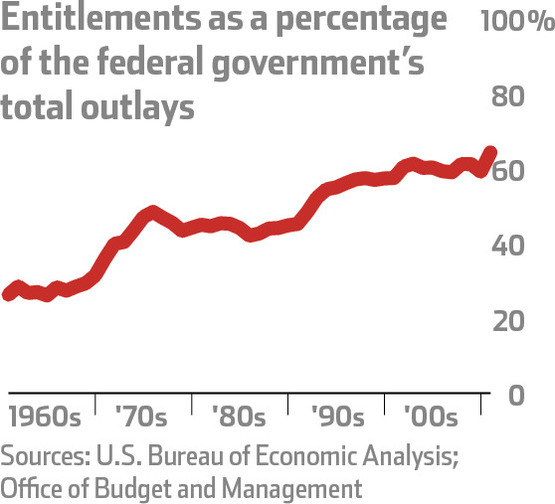 To be sure, it’s possible to reverse this trend if we implement entitlement reform. But how likely is that given the short-sighted outlook and self-interested attitude of the political class. P.S. You can enjoy some cartoons about dependency here, here, and here. If you need some more humor, this cartoon looks at the issue from the government’s perspective, and here’s a great Ramirez cartoon about Julia, a.k.a., the poster child of dependency. P.P.S. Redistribution is bad for prosperity because you’re paying some people not to produce and you’re penalizing some people who do produce. To get a better idea of how the former kills incentives, look at this amazing chart. It is a real danger. I hope the American people are smarter than that. “Redistribution is bad for prosperity because you’re paying some people not to produce and you’re penalizing some people who do produce.” That’s some mighty perfect plain talkin’, thanks for it. I could beat my head against the computer will it squishes, though, for the fact that so many refuse to acknowledge this basic fact of human nature. Does a majority of Europeans want more government and more taxes? I believe not. There is what you want — what you vote for — and in the end what you get from politicians, a profession whoose main product, almost by definition, is mandatory collectivism. It is difficult to support ideas that will curtail your profession. So a, say,30% of useful idiots is probably enough to trigger decline. Politicians and their inherent incentives will provide the remaining 20% to bump mandatory collectivism, more government, flatter effort reward curves, less economic efficiency, and subpar growth into majoritarian status. Like in business, same in politics and economics, international competition outcomes are most often determined by narrow margins. The margin of american ideological exceptionalism, compared to the rest of the world, is now very thin and the tipping point has probably been reached, most likely already passed in 2008, as indicated by the fact that Americans elected Obama to correct Bush’s mistakes. The French elected Hollande to correct Sarkozy’s mistakes. Don’t you see dear Americans that you’re already in the grips of the irreversible cycle to decline? I’m putting myself on a limb here, but I would not be surprised if Mr. Mitchell is simply living the twilight years of his American existence blogging and then takes his modest Cato proceedings and retires to the Carribean in a few years. Perhaps when ObamaCare starts covering his medical premiums? and leaves you behind to pay the bills, he can finally concentrate on what he really likes to do. Ok, the specific application of this plan to Mr. Mitchell is highly speculative, but you get the general idea. Decline ahead! More HopNChange, flatter effort reward curves! The danger is not that Atlas will shrug, but that Atlas will take his toys and go elsewhere. Really a GREAT opportunity for some of the other nations that have gotten it that social democracy does not work and is recipe for a slow decline. It is miracle that they have not been overtly marketing themsleves as an idilic alternative for the entreprneurs and businesses to just skip all the built in overhead of taxes and over-regualtion by relocating.